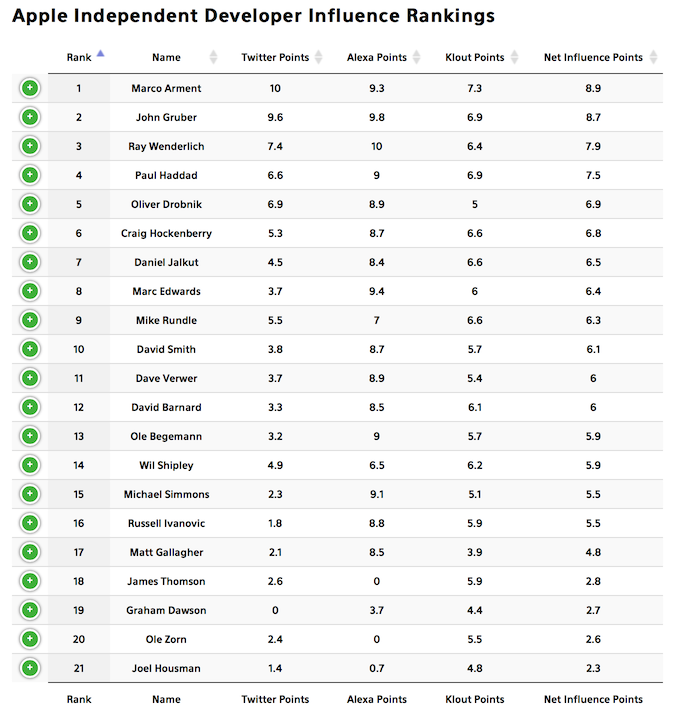 Here is an interesting take on just who are the most influential indie Apple developers, using a tool for ranking people’s influence in their particular field, based on twitter and website stats. It was developed by Ross Dawson, who first used it to rank KeyNote Speakers. You can find out more about the algorithm it uses from his detailed and fully-transparent explanation of how it works. Here is a snapshot of the rankings as at 11th March 2015 18th Jul 2015. Note – As this is a graphical snapshot, the green buttons are inoperative – they normally would show you the twitter handle and website link used. I hope to replace this with a fully-functioning *live* version, eventually. Please note – I have compiled an initial list based on my own conjecture about who was reasonably prominent in this field. If you have a suggestion about who else to add, please let me know via twitter @gpdawson. Note that the individual must have 1) a twitter account and 2) a website or blog for which they are the primary contributors. Generally, anyone with a company website with multiple contributors can’t realistically be included without distorting the results.